Will China’s biggest beautifier Meitu ever be profitable? Meitu has proven to the world that there is a demand for beauty-enhancing software products, but it has yet to show investors that its selfie-loving users are willing to pay for its feel-good apps. On August 24, Meitu Inc. reported an RMB 33 million ($4.95 million) adjusted net loss for the first half of 2017, down 87 percent year-on-year. The company, which went public in 2016 and became the largest internet IPO on the Hong Kong Stock Exchange since Tencent, continues to draw skepticism about its ability to turn a profit. Founded nine years ago in China’s southeastern coastal city of Xiamen, Meitu has transformed from a PC photo touch up software to a suite of beauty-enhancing hardware and apps. The latter include its three pivotal products on the path to monetization: Meitu, its legacy photo-enhancing app; Meipai, a short video sharing app; and BeautyCam, a selfie app. The company now claims 461 million monthly active users (MAU) and has pocketed RMB 2.18 billion ($327 million) in total revenues in the first six months of 2017. In comparison, the Chinese dating app-turned-live streaming social app Momo (NASDAQ: MOMO) has made $577.5 million in net revenues in the same period with 91.3 million MAU. Meitu has a mission to empower users to become more beautiful, and it trusts that it can cash in on its predominately young, beauty-conscious female users from ads, e-commerce, and games—the three major revenue channels on the Chinese internet, currently dominated by the BAT trio of Baidu, Alibaba, and Tencent. As a self-labeled “internet company”, Meitu’s revenue has so far mainly come from hardware—smartphones that can detect your skin tone, age, and gender to touch up your selfie accordingly. 847,090 units of these phones were sold in the first half of 2017, contributing to 88.7 percent of Meitu’s total revenues. Smartphones are costly to make, however, and fierce Chinese smartphone giants like Huawei—who shipped 73.01 million phones in H1 2017—are clamoring to get in on the selfie game. 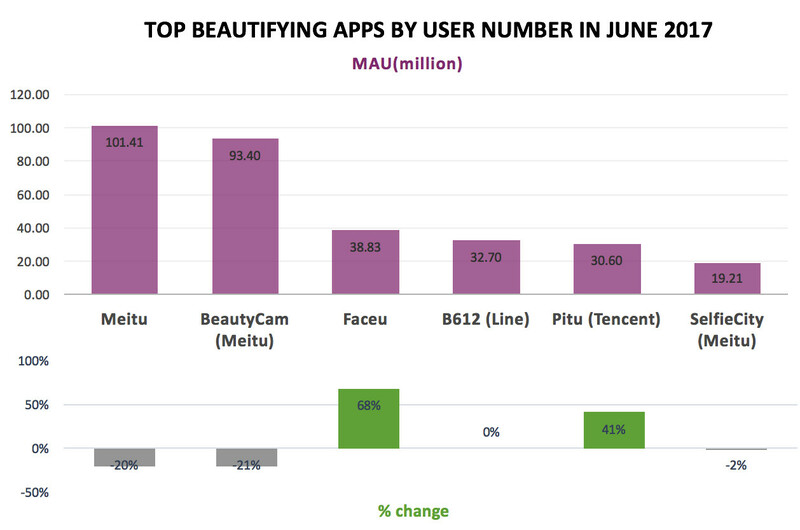 Although Meitu and BeautyCam are by far the biggest players in the area of beautifying apps, they stand as utilities, suffering from high replaceability and low average usage time. A QuestMobile report shows that in June, rising players Faceu and B612, whose parent company Line merged it with the popular Korean app Snow, are edging in while Meitu and BeautyCam saw 20 percent and 21 percent declines in MAU respectively. Meitu knows its shortcomings, so when it went public, CEO Wu Xinhong announced a vision (in Chinese) to turn the company into a social platform to monetize its gigantic user base. Meitu’s other core product, Meipai, which means “beautiful filming” in Chinese, has been the major drive in the company’s platformization and monetization plan. According to Jpush’s data (in Chinese), Meipai has a 3.5 percent penetration rate after Kuaishou, whose 13.3 percent gives it a vital lead amongst China’s short video apps. This is a fast-rising sector thanks to the nation’s increasingly cheap data and growing mobile penetration. While industry watchers question the purchasing power of Kuaishou’s lower-tier city users, Meipai’s overwhelmingly young, female users from tier 1 and 2 cities, a main force in the “she-economy,” seem more promising. The short video sharing app began generating revenue last year by selling virtual items in live streaming and this segment has become a primary boost to the parent company’s increased revenue in internet value-added services. But no one can guarantee these users will stay. As is the case with live streaming, short video platforms are burning money to poach talented content creators. Toutiao, now valued at a staggering $22 billion, recently announced an RMB 1 billion ($150 million) subsidy plan (in Chinese) for its new short video arm Huoshan. Meipai also debuted an initiative to match brands with KOL (key opinion leaders, or internet celebrity), with whom Meipai shares revenues. The outlook for ad revenues is more dismal. Advertisers still favor long-form videos like drama series or game shows on major video portals. After all, how many users want to watch a ten-second ad for a one-minute video? In March, Meitu launched Pushion (美铺), which means “beautiful shop” in Chinese, to test the water of fashion-focused e-commerce. The market is already crowded with existing players like Xiaohongshu and Mogujie, not to mention e-commerce giant Taobao which fashion KOLs call home. It remains to be seen how a company can turn a generation’s beauty obsession into commercial possibilities, as Cai often reminds Meitu’s analysts: the company is still in the infant stages of monetization.